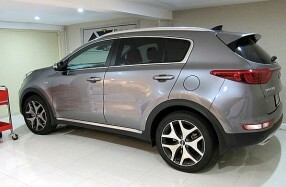 Neil chose the Sportage to go one better than the Harman Kardon system offered in other Kia models. Using some pre-loved gear from his previous vehicle and new product, we did just that! Added a Nakamichi MB-70 6 cd mechanism to the factory non cd head-unit. Old-School Nakamichi amplifiers and active crossovers all neatly out of the way and under the front seats. including SLS200 subwoofer, BSM 160 woofers and HF30b Tweeters. To match any top-end home HIFI system.